I don’t know many things about my great-grandfather. He died before I was born. I don’t even know what he looks like, but I do know three things: His name was Harry, he had a family that included my great-grandmother and my grandpa, and he had a Purple Heart for serving in World War I, back before that side of my family came over to America. Considering the psychological aspect of warfare and the overall impact it has had on politics, history and people, it deserves more attention than a lot of games give it, especially since many of us are connected. There’s nothing unique about a videogame based in history. There is a seemingly endless supply of World War II shooters and retellings of modern-day conflicts. War is a popular set-piece in general media but, unfortunately, most games glance over the emotional impact in favor of the action, the guns and the explosions. 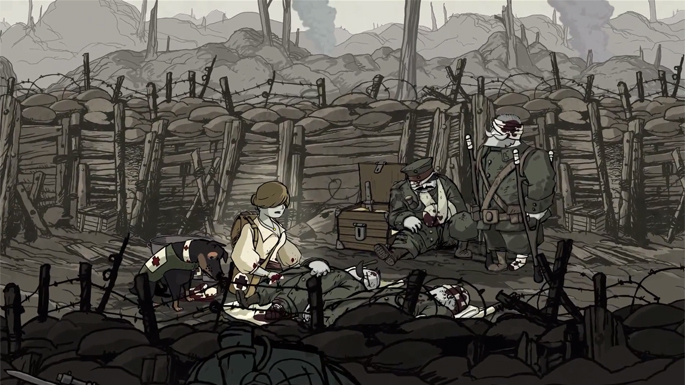 Valiant Hearts: The Great War strives to be the antithesis in a sea of war shooters. Its purpose lies in the history of World War I and the people affected by it and anything else involved comes in as a second priority. It exists beyond a simple side scroller or puzzler and reaches right into real world events to provide an emotional tale of survival and family. 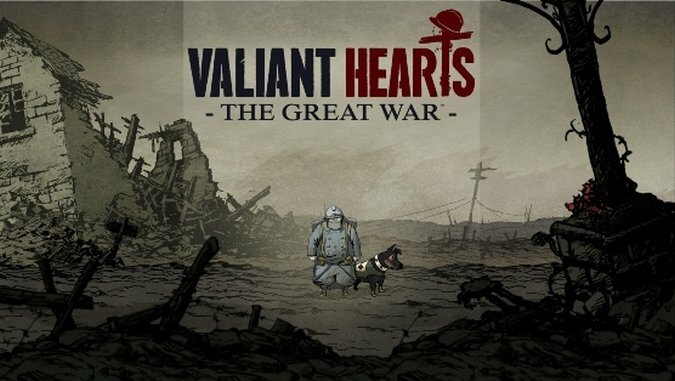 Valiant Hearts is an ensemble piece, allowing you to play four characters that have been brought together in the middle of WWI in France by circumstance. Working either with each other or towards each other, they want to each fulfill their own wishes, whether its returning home to family or enacting revenge. Each of the stories depicted is part of a bigger picture where the soldiers drafted and separated from their homes want the same thing, no matter what side you fight on (one of the characters is German). It provides a sense of agreement across enemy lines, where bodies continue to pile up and goals move further away. The stories aren’t complex but their simplicity makes it easy to identify with, especially when it concerns the threat of death. It’s easy to picture people like my great-grandfather in the middle of these battles, worrying about starvation and trying to just make it to a safe zone with as many comrades as possible, even if that didn’t happen. Besides these stories, there are the historical anecdotes, which come up as you traverse levels and uncover hidden collectibles. Each level and change in locale begins with a short summary of the battle that took place there, along with lessons on the efficacy of tools such as gas masks, overall providing a deeper understanding of World War I then the gameplay itself can deliver. It puts you right in the middle of landmark battles and allows you the option to learn the full picture that exists outside whichever character you’re playing as. While you’re trying to plant dynamite in the latest puzzle, the history is there to state that happening all around you is a months-long battle that will result in the death of hundreds of thousands of soldiers. It plays around with your perspective, creating another level of story besides the present in which your character exists. It makes for a very interesting complexity that is missing in other games. However, Valiant Hearts is a piece of entertainment, which means that the game tends to walk over the line of realism into cinematic sensationalism. Despite the fact that it touts being based on true events, there are elements that go against this in favor or excitement. For example, there are sequences where our heroes are being chased by tanks, events that feature highly choreographed barrel dodging that seem at odds with the rest of the scenes. The swerving, loud classical music and cartoonish elements don’t match the rest of the game’s dramatic tone, like they were part of a separate game that Ubisoft decided to cram in at the last minute. They occur only a handful of times, but they’re jarring enough to feel more time consuming than they are. Other similar instances also cause weird disassociations with the story. A major aspect of solving puzzles is using a dog to enter areas you can’t reach. The dog is able to move levers, fetch items and distract guards, displaying a larger range of intelligence than the enemies that you are supposed to be fighting. It’s a small nitpick, as the dog does play an emotional role in the reuniting of certain characters in later chapters, but it’s another example of the sometimes cartoonish dramatization of one of the bloodiest wars in international history. Any complaints about smaller elements are forgotten by the final chapter, where the journeys of these four characters come to a head. As the levels get more graphic and the puzzles become more gruesome, the player begins to realize the true scope of the war that seems so useless as the death toll piles up. Considering that some of the battles depicted in the game resulted in thousands of casualties, it makes sense to have areas where your character has to hide from gunfire behind piles of corpses, soldiers sacrificing their lives even in death. It makes sense to have your character kill dozens of soldiers per puzzle just to reunite with a comrade. Finally, it makes sense to realize that any one of the four people you are able to inhabit might not make it to the end. The true impact of the war is very much real in Valiant Hearts and it helps to honor those who lost their lives or sacrificed some piece of themselves in the war. It makes me wonder what my great-grandfather lost when he gained his Purple Heart.